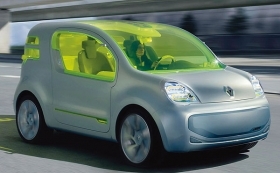 Renault sees the European electric car market growing to a minimum 2 million units annually over the 2015-2020 period. Shown is Renaults Z.E. Concept. ROUEN, France -- Renaults planned 2012 launch of electric cars in Europe is based around the continuation of generous government purchase price subsidies and no new taxes on electricity used as vehicle fuel, a top executive said earlier this month. The French carmaker expects France to maintain a 5,000 purchase price subsidy for buyers of very low or no-emission vehicles, said Jerome Perrin, head of Renaults research, advanced studies and materials division. Perrin told participants in a conference sponsored by the Moveo auto industry cluster that Renault expects other European governments to maintain policies aimed at stimulating electric car purchases. In 2012, we will need these conditions, even if it is clear that the situation will have to change by 2020, Perrin said. Renault sees the European electric car market growing to a minimum 2 million units annually over the 2015-2020 period, Perrin said. The French carmaker is betting that its early launch will push sales of lithium-ion-battery-powered cars to several hundred thousand units annually by the latter part of the decade, Perrin said. The economic slowdown has not diminished Renaults enthusiasm -- or continuing investment with Japanese alliance partner Nissan Motor -- in electric car projects. Perrin recognized, however, that a number of as-yet unresolved issues could still slow the pending electric car launch. These include questions over the cost of operating an electric car for drivers and uncertainty over whether carmakers, car buyers, or third-party leasing companies will pay the high expected battery purchase prices. Serious questions also remain over how drivers will charge electric car batteries. Renault and other carmakers are working with public authorities and private sector firms to develop both a network of public battery charging stations as well as battery changing points at existing service stations. Running battery changing stations is a service activity, and theres no doubt were going to see an industrial investor step in and handle that, Perrin said. Carmakers and utilities are working together at the European level to ensure standardization of charging infrastructure, Perrin added. The discussions will be ongoing throughout 2009, but should lead to the development of harmonized approaches from 2010, Perrin said.